Was thinking about this moment from our trip this summer, so I decided to share. This was taken at about 8:30am, long before everyone else gets up and heads down to the beach. We always like to go early in the morning. You get the best spot, the best view, nobody kicks sand in your face and by the time the beach gets too crowded it is time for lunch and a siesta. Oh yes, and it was already 105 degrees farenheit, 120 with the humidex, so we needed to cool off in the ocean already. That is a very sweet picture Anna, even more precious since it brings you such fond and warm (or rather HOT ;) ) memories. 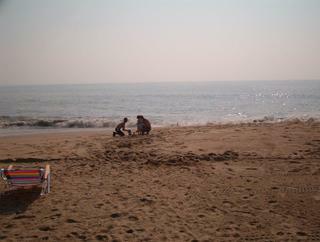 Thanks Nancy, it was a great Moment, the closest the little one got to the water, but well.. there is always next year. GREAT picture!! No wonder you love it so much! Great Picture...I would love a moment like this.